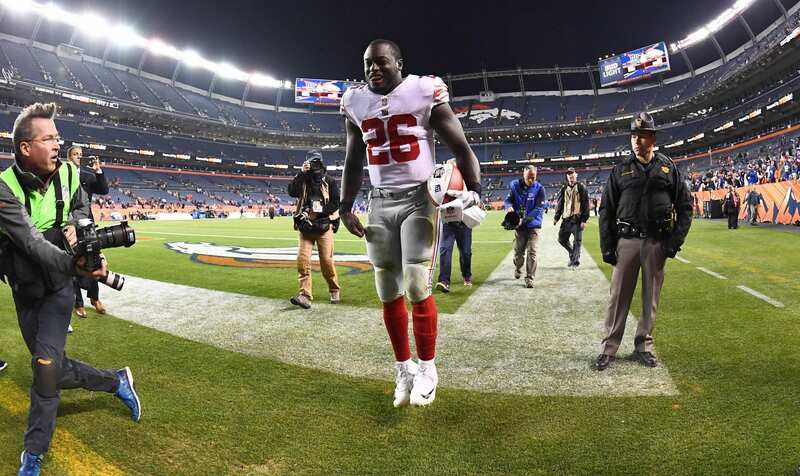 Home New York Giants Report: New York Giants To Resign Orleans Darkwa, But Why? If the rumors are true and the New York Giants are looking at drafting Saquon Barkley with the No. 2 overall pick in the 2018 NFL Draft, then why should they re-sign Orleans Darkwa? Well, Darkwa had a solid year in 2017, racking up 751 yards and five rushing touchdowns, averaging 4.4 yards per-carry. Pretty shiny stats for a player that was running behind a makeshift offensive line. Bringing Darkwa back to the Giants is a glorified insurance policy, but at what price can they have him? The fourth-year back only counted $1 million against the cap in 2017, but he will be looking to up that price to around $2.5-3 million. With All-Pro gaurd Andrew Norwell set to make a splash in free agency with a hefty $13 million per-season contract, there won’t be much money available to sign Darkwa, unless they can get him for under $2 million per-season. The interesting thing about the potential re-signing of Darkwa is that he’s not needed anymore. The Giants have their choice of the crop of stud running backs entering the draft, and they additionally have Wayne Gallman and Paul Perkins on the roster. So, if they decide to resign Darkwa, maybe the Giants are planning something quite extravagant after-all.